VCRD helped bring Front Porch Forum to every town in Vermont through our eVermont Community Broadband and Vermont Digital Economy projects. This article expands on the history of this unique social network designed to build bonds between neighbors and make communities more resilient. In August 29th, 2011, Tropical Storm Irene passed over Vermont, the first such storm to hit the state since 1938. Almost every river and stream in the state flooded. When the water receded, four people were dead and numerous towns faced a massive cleanup, with nearly $700 million dollars worth of damage across the state. One of the affected towns was my hometown, Moretown. Nestled on the edge of the Green Mountains, it’s the classic definition of small town: no stoplight, a combined general store and gas station, a tiny library, and a single elementary school, all serving a population of just under 2,000. When Irene passed overhead, the floodwaters topped the banks of the Mad River, and flooded more than 60 private homes and public offices, including the post office, fire department, elementary school, and town offices. Moretown isn’t a place with significant emergency-response resources, but the residents did have their neighbors — and a new online message board called Front Porch Forum. In the aftermath of Irene, the residents of Moretown used this online community to coordinate meals for those left without a home, request assistance with the cleanup, or offer help with preserving family pictures. The town government had never set up an official online presence, so it began using the forum, too, posting official updates and keeping everyone apprised of developments in the cleanup. Front Porch Forum had come to Moretown just months before, but the site had spread throughout much of the state, town by town, since it was founded in 2000 in Burlington. The site looks like a relic from another era; its website is clean and minimal, without the pictures, reaction buttons or comment fields that most social platforms have implemented today. Users register using their real name and address, and gain access to the forum for their town or neighborhood. This network of 185 forums covers each town in Vermont, as well as a handful in neighboring New York and New Hampshire. While most towns possess their own forum, the more populated areas of the state, such as the cities of Burlington and Montpelier, are split up into more manageable districts. During normal times, people might use it to alert their neighbors about everything from runaway Roombas to notices about garage sales or public meetings. But in a pinch, it proved essential when it came to coordinating disaster relief. Meg Allison, the librarian for Moretown’s elementary school, recalls how quickly the town mobilized in the aftermath of Irene. Over the course of the summer of 2011, people “were slowly gathering momentum and using [Front Porch Forum],” she explained, and “suddenly, it became the go-to place for sharing flood and FEMA information.” The town board even began to print out the day’s digest of postings, pinning them to the front door of the town hall. “It became the way the town communicated,” Allison recalled. Town residents pitched in to help those who lost their homes: they cooked meals and offered help. Allison, whose own home was out of danger from the floodwaters, offered up her own expertise, helping her less fortunate neighbors preserve water-damaged family pictures. Allison says that her tiny town was prepared for the disaster in part because its residents had been using the forum for months, and in that time, it had helped to build and reinforce their relationships with their neighbors. As a result, when the storm hit, Moretown had a new tool at its disposal: those pre-existing relationships that had been strengthened by the multitude of tiny interactions facilitated through the forum. Towns that lacked the forum certainly had resources and their shares of neighborly connections that helped them, but the forum helped provide a durable piece of infrastructure to encourage these relationships in the preceding months. Front Porch Forum is similar to a Listserv: networks that were commonplace on the internet by 2000 but waned as modern social networks arose, their roles absorbed by sleeker, multibillion-dollar platforms like Facebook, Twitter, and others. Yet despite the competition from those larger sites, Front Porch Forum has not only persisted, it’s thrived in Vermont. Since its founding in 2000, it boasts nearly 160,000 members, or just under a quarter of the population of the state. Bringing people together, and forming communities — this is, of course, the stuff of Facebook mission statements, and a mantra that’s been so often repeated in a year of scandals and outcries over the prevalence of toxic behavior and the glacially slow pace when it comes to addressing it. The broad social media industry has been forced to contend with the desire to allow for a great latitude of freedom for its users and the inventiveness of bad actors that seek to manipulate social media for their own ends. While sites like Twitter and Facebook have found that they need to introduce new features, fact-checkers, and tighten up their rules around bad behavior, they have a long way to go to regain user trust. It’s in this environment that Front Porch Forum has been operating, doing all of the things that its bigger rivals say that they want to do: bring people together and provide a safe environment online. Michael Wood-Lewis and his wife Valerie got the idea for Front Porch Forum in 2000, shortly after they moved to Burlington from Washington, DC in 1998. Michael had just left a job at a business-to-business startup and was looking for a new project. It was a challenging time for the family. Their son, Benjamin, developed cerebral palsy shortly after he was adopted, and as newcomers to Burlington, they struggled to meet their neighbors. “Almost all families go through periods of great need,” Michael told The Verge, “and historically, neighbors were a key part of peoples’ support networks. Valerie and I realized that Ben’s severe cerebral palsy would require more than we could provide on our own.” While their neighborhood was active and outgoing, the family had trouble breaking in. “Enter Front Porch Forum,” Michael says. Michael came up with the framework for a Listserv he called the Five Sisters Neighborhood Forum, and printed up a stack of fliers, which he distributed throughout his Burlington neighborhood, inviting his neighbors to join. Hosted through a third-party provider and armed with an Excel spreadsheet, he designed it as a space for neighbors to share information and updates about the area. Online communities were beginning to change, with Listservs and online forums giving way to the ancestors of today’s social networks. Sites like Six Degrees, Classmates.com, or PlanetAll allowed users to create individual profiles and connect with other people they might know — or didn’t know — online. While Wood-Lewis’ Burlington forum didn’t allow for individual profiles, it did tap into a similar desire: contact with one’s community and neighbors. Michael explained that the Five Sisters neighborhood was home to “lots of community organizer types,” and, as a result, his list was instantly popular, with hundreds of people signing up within a few months. It was a remarkable response, Michael says, because it came at a time “when it wasn’t even guaranteed that people even had internet in their homes.” Over the next six years, he operated it on the side, and people used the list to do everything from solicit recommendations for local plumbers or carpenters, let their neighbors know about that wandering skunk, or opine on local issues. For years, Wood-Lewis manually compiled each day’s submitted posts into a digest that he would then send out to the list each evening. When Maurizi left the state, Wood-Lewis had to scrape together money for an update every couple of months. “We really couldn’t add features,” he says. “It forced me to innovate along different lines, instead of developing new features or tweaking color schemes.” To generate revenue, he began cold-calling local businesses to advertise on the site. That allowed him to hire a neighbor to help moderate the site and develop the procedures needed for handling the growing population. The relaunched site maintains many of the same functions as the original Listserv. Users can now post messages directly to the site, which their neighbors can read by logging onto their forum or receiving the day’s postings in their inbox in a daily email digest. Users have the option of replying directly to those messages, either by displaying their feedback in the next day’s digest or contacting the poster directly via e-mail. They also have the option to make their listing viewable in neighboring towns — useful if you’re casting a wide net for recommendations or if you have a missing pet. 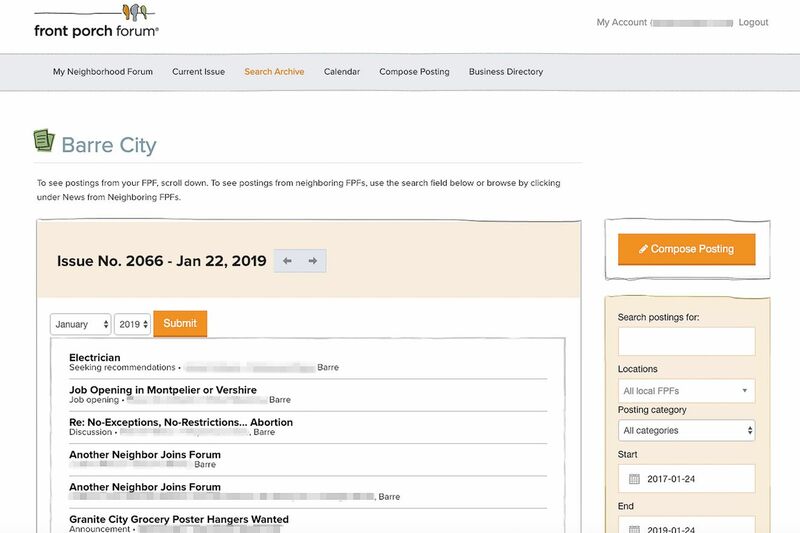 Each forum also displays a list of participating public officials — everyone from mayors to state representatives to librarians to justices of the peace — and users can navigate through the archive of postings or a community calendar. Unlike Facebook or Twitter, the forum doesn’t provide members with individual profile pages or allow members to select who their friends are. Just as you can’t choose which neighbors surround you, you’re surrounded by your neighbors online. An entire generation of social networks grew since the forum launched: MySpace, Friendster, Facebook, and Twitter. Built on the ashes of the first generation of social networks, these platforms offered people entirely new ways to communicate with one another. Despite those competing sites, Wood-Lewis’ project was a hit locally. “People were telling me stories daily about how impactful it was,” Wood-Lewis recalled. He began to throw out a one-time fee as a startup cost for each town, based on the complexity of the desired forum and the state of their software. Residents raised the money themselves, went to businesses or their local chamber of commerce for funds, or applied for grants to pay the few thousand dollars that the company required. Critically, the site’s growth was organic, growing as demand allowed. As the site began to expand across the state, it slowly grew its team of community moderators, who proactively skim over each post to make sure it adheres to the site’s code of conduct. While major social media sites like Facebook and Twitter have teams who review reported posts, they do so in a reactive manner — users have to flag something that’s out of character. While Front Porch Forum has developed tools to automate some of the review processes, it’s kept its human moderators in the loop, working to make sure that what’s being posted to the site isn’t detrimental to the community. Along the way, the company experienced two major boosts. The first came in 2011 with eVermont, an initiative from the Vermont Council on Rural Development, which had won a federal grant to expand internet access to rural parts of the state, and Front Porch Forum was part of the package offered to towns that applied. But the biggest boost came in the aftermath of Irene (as well as another major flooding event earlier that summer around Lake Champlain), which spurred Front Porch Forum to go statewide. After the storms, the Vermont Council on Rural Development earned a second major federal grant to increase the resiliency of at-risk towns. Once again, Front Porch Forum was part of the package, allowing it to expand to the rest of the state. As of summer 2018, Wood-Lewis notes, 160,000 of Vermont’s 260,000 households are part of the network, and of those households, 50 percent of users post to the forum, while 79 percent take “offline actions” due to their membership on their local forum. “Our goal is to make Vermont resilient in the face of other coming issues,” Wood-Lewis says. Irene was a stark reminder that a changing climate will have an outsized impact on a tiny, less prosperous state. While resiliency took the form of better culverts and ditches to manage water from major storms, Front Porch Forum was pitched as a way to make those communities more resilient by shoring up the bonds between neighbors. Interactions on Front Porch Forum can range from serious, to utilitarian, to downright goofy. Earlier this year, I found a builder to construct a set of floor-to-ceiling bookshelves in my house through the site. One recent Burlington post asked for the whereabouts of a household Roomba, which had been tasked with cleaning a porch, only to escape down the street. (It was later recovered). In the lead-up to this year’s midterm elections, my local forum lit up with neighbors discussing their local candidates, talking about everything from their stances on a proposed carbon tax to school spending. Front Porch Forum isn’t designed as a virtual replacement for one’s real-world neighborhood — it’s meant to facilitate those everyday, in-person connections that form the basis of a community. Wood-Lewis says the site changes people’s perceptions of where they live, because the connections it facilitates impart a sense that it’s “a real place of real people,” and these interactions give its users a sense of ownership of their community. The two had never met before, but after their meeting, they decided to set up a food bank. Six months of planning and work later, they opened up their food shelf in the United Church of Westford, a modest collection of shelves that still helps the community over a decade later. Andrews says that they use the forum to put out the call for donations and to advertise the food bank’s hours and policies. The forum, Andrews says, is “word of mouth on steroids,” and said that “people just come out of the woodwork” to help stock the shelf. Others have found the forum to be an ideal platform for contributing to the community in other ways. Since retiring as a teacher in Barre, Vermont in 1998, Nancy Wolfe explained that she saw a distinct lack of hometown pride in her central Vermont city, a blue-collar town that’s earned a reputation for crime and drugs in recent years. Several years ago, she began a home-brewed research project into the city’s storied history in an attempt to inject some civic pride into her neighbors. Attempts to hold a series of talks never yielded a good turnout, but she found that the city’s forum provided an ideal venue for her efforts. She broke her work into small, manageable chunks, and began posting it — a paragraph at a time, a couple of times a week, sharing the town’s history of granite mining and sculpting. Politicians and city and town officials find the site useful as well. Front Porch Forum sells an access package to politicians, allowing them to observe the towns or counties that they represent. Burlington Ward 6 City Councilor Karen Paul uses the forum as a way to keep her constituents apprised of her work in city government. “When I go door to door during campaign season, there’s no question: a lot of people will say to me that they read my posts on Front Porch Forum,” she told The Verge. That sentiment was echoed by Washington County State Senator Ann Cummings, who said that it was a good way to learn about issues that “were bubbling up in the community,” and noted that it was another tool that she could use to stay engaged with her constituents. Since Front Porch Forum’s founding, other sites have popped up to occupy a similar space in the industry, such as Nextdoor. Founded in 2011, Nextdoor allows individuals to map out a neighborhood and post recommendations, events, lost and found reports, and other items of interest. But the tenor is notably different. Loud, back-and-forth comment threads are frequently featured on platforms like Best of Nextdoor, but the interactions on Front Porch Forum are typically a bit more low-key. While you still get poorly worded responses or snarky back-and-forth discussions on the forum that would be worthy of Best of Nextdoor, the discussion feels less like gossip, and more service-y. This appears to be by design; where the major social media sites prize the number of interactions through features like post comments or reactions, discussions on the forum move at a slower pace. Front Porch Forum structures its conversations differently than the likes of Facebook, Twitter, and Nextdoor, slowing the pace down to prompt users to think a bit more about what they’re saying before their community. There’s no news feed with rapid-fire updates to check every couple of minutes. You can fire off an angry reply to a neighbor over something they wrote — but it will show up a day later on the site. Wood-Lewis said that they’ve had more than one user write to the site directly, asking to retract a comment written in haste. It’s harder to get in a flame war when each exchange takes 24 hours to respond to, at least on the platform itself. This isn’t to say that Front Porch Forum is free from heated discussions. While it’s easy to find bad Nextdoor posts, Front Porch Forum has its share of passive-aggressive and irritating users, arguing for days over issues relevant only to a small group of people. For example, the destruction of a home in Winooski earlier this year unleashed a flood of now-homeless rats into nearby properties. When someone asked about how to remove the rats, neighbors engaged in a fierce debate over the ethics of trapping and killing animals. In another recent posting, someone reported that their car was smeared with dog poop after complaining about unleashed dogs. And as this year’s midterm elections approached, the site saw an influx of political advocacy. But on the whole, the platform’s approach to discussions helps maintain a largely civil discourse. But a bigger reason for the civil tone likely comes down to the fact that the users are all part of the same real-world community. And unlike Facebook or Twitter, where someone without a stake in a conversation or issue can drop in to interrupt and derail discussions, Front Porch Forum’s requirement that someone list their address helps to protect against outsiders from sabotaging local conversations or spreading misinformation. “People tend to have thick skins around topics,” Wood-Lewis explained, “but not around people.” It’s okay to call out a bad idea, but it’s not okay to call the person an idiot for doing so. Wood-Lewis says that the community manager team performs a vital role for the site, and that they go through a “months-long in-house training that covers all aspects” of the work that they perform, and that when a problematic post does come up, it’ll be reviewed by multiple OCM members. When a post is flagged, it’s reviewed, and the author is contacted. Most authors, Wood-Lewis says, aren’t mad that their post was stopped: “Often, we are greeted with expressions of relief,” happy that a post written in the moment was pulled back before it caused problems. In most extreme examples, the moderators will just close an individual’s account. Some users have complained about Front Porch Forum’s approach to community moderation. In 2013, one user posted a comment about not wanting to use poison to deter wildlife in their yard, unless they’re planning on killing “some useless right-wing radio talk show host,” which raised several complaints from users, and resulted in one of them being kicked off the site. Mejia’s response was to address those statements head-on, issuing corrections with facts, which earned another round of responses from neighbors who “were horrified at what the other person had written.” Mejia urged them to take their horror public on the forum. “Although I appreciated the personal support that I was getting, it was important for the community to see that those anti-black world views that were expressed are not common in our area.” Mejia noted that moderators from Front Porch Forum contacted them as this played out, saying that they were monitoring the exchange, in case the discussion devolved. Now that the site covers all of Vermont, the company has begun to take tentative steps beyond the state’s borders. The site included one tiny New Hampshire community as a result of a federal grant, and the company has recently expanded to a handful of towns in New York’s Washington County — Argyle, Cambridge, White Creek, and Jackson — with the hope that they’ll continue into others as time and word of mouth progresses. But Wood-Lewis says he doesn’t want to take over the world: scaling up too quickly would mean outstripping their workforce. He explains that now that they’ve gotten a handle on the site’s growth, they’re looking to begin tackling the long list of updates that they’ve always wanted to hit, and they recently hired their first in-house software engineer to work on it. “We’re settling up some deferred maintenance and software debt,” he says. Wood-Lewis described his company’s revenue as having three components: ad sales to local businesses — the largest source of revenue for the site — which purchase unobtrusive blocks in the digests a few times a year; custom subscriptions for politicians or local governmental officials to access the forums of their constituents or jurisdictions, either to notify them of updates or to reach constituents in multi-town districts; and a yearly NPR-style pledge drive (that raised $150,000 this year), which is only a small percentage of their budget. “All three of those products, interestingly enough,” he says “came about because people knocked on our doors.” The site’s users wanted to advertise, gain access to multiple forums, or simply give the site money because they found it to be really useful. While a social focus remains at the forefront of the company and its direction, it’s still a for-profit enterprise. The company’s slow growth came due to restraints from available resources and funding, but that conservative handling has prompted a far more thoughtful approach to how it serves its members. Where bigger sites have parceled out shares of the company to multiple individuals, Front Porch Forum remains solely in the hands of Wood-Lewis and his wife. That arrangement allows them to exert a level of control over the look, feel, and direction of the company and its social mission. For now, Wood-Lewis is more interested in adding features (the company says that it is working on a mobile app) and focusing on local communities than in driving growth.